Extract beef marrow from beef bone and place in a pan. Add beef broth and bread crumbs. Cook over medium heat, stirring continuously until mixture is reduced to a thick paste, about 8 to 10 minutes. Mixture will be slightly lumpy. Clean pieces of chicken liver, removing ligaments. Remove chiken heart. 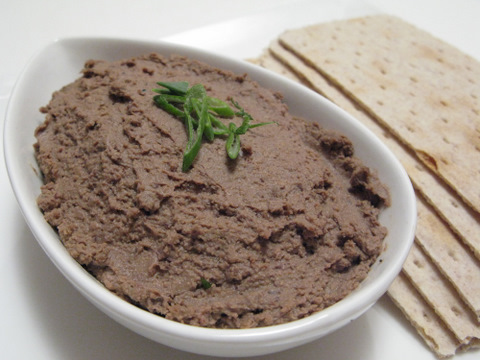 In a food processor or blender puree liver. Add borth paste to the liver and puree once more. Add eggs thick cream, and cognac or red wine. Season with salt, pepper, cayenne, and herbs. Mix once again. Butter the sides of ceramic dish (or any oven proof container). Pour puree into ceramic containers and bake in water bath(bain marie style) for 30 minutes at 350 degree F or until fork dipped into the paste comes out clean. Let cool. Pour melted butter over top and refrigerate. Ounce chilled, the melted butter forms and protective film over the pate. Serve on decorative vegetable containers such as cucumbers (shown in photo) with bread and crackers. End.